We know that audiences for news and information are moving toward digital, mobile news sources. According to Pew Research, 43% of adults “often” get news online, trailing only TV (53%). And most adults (85%) get news from a mobile device at least some of the time. Understanding this audience is essential for news organizations — local and national — that hope to grow and sustain thriving audiences for news. Yet little is known about the preferences and habits of this emerging audience, more oriented around digital, mobile content and consumption. Greater content consumption (by hours and by shows listened to). A preference for subscription and time-shifted consumption. Reliance on mobile consumption, usually in transit. A willingness to promote content to others, and reliance on word-of-mouth. A preference for in-depth content. A loyalty to public media, and willingness to invest — even as broadcast consumption levels decline. Some of the biggest differences between respondents to this survey and the podcast listeners we have sampled in previous representative surveys are in their consumption behaviors. Weekly podcast listeners in the Knight sample consumed just over 10 hours of podcast content per week, compared to a little over five hours per week reported from the Infinite Dial report, by Edison Research and Triton Digital. The average number of shows listened to per week was much higher with Knight respondents (13) than with weekly podcast listeners from the Infinite Dial (5). The dominant modality for podcast consumption also differed. In this project, 81% of respondents told us that they “subscribe to podcasts and download automatically to listen later” — significantly higher than the other two modalities of listening (click and listen immediately; download manually and listen later). 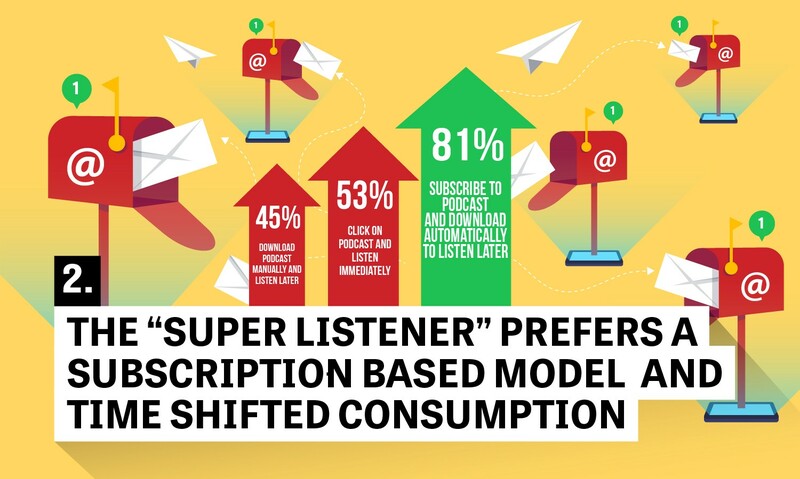 This statistic differed greatly from both our Infinite Dial data and the national online panel sample we conducted with one of the Knight partners this year, both of which showed subscription behavior third, with “click and listen immediately” as the dominant modality. 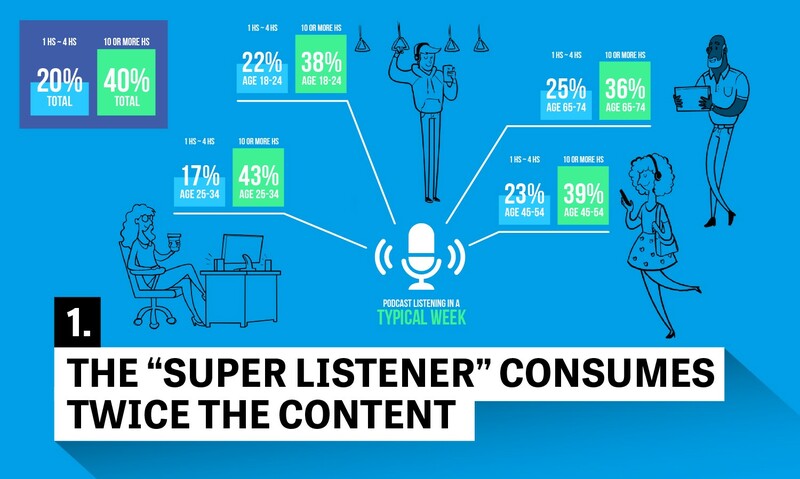 These data points (hours/shows per week, listening modality) can be inferred to be indicative of a key difference between the Knight respondents and those surveyed in the other research we have done: respondents to audio callouts are much more likely to be “super listeners” — consuming more content, more likely to subscribe, and also more likely to have been listening to podcasts for longer than the average podcast consumer. 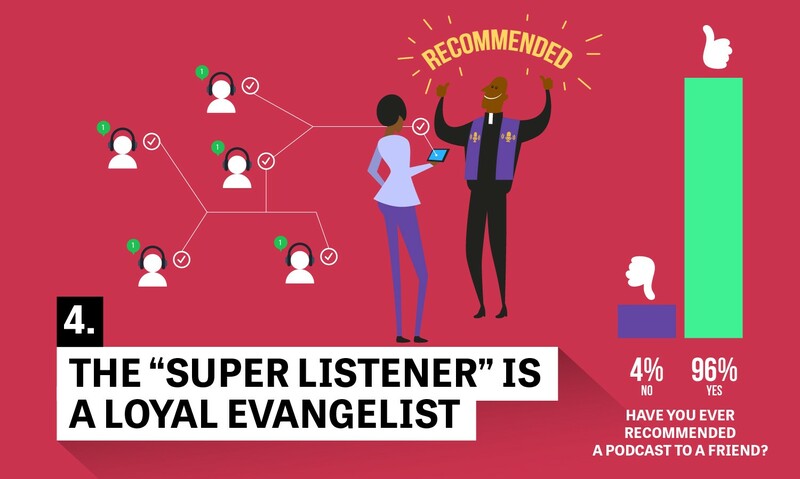 So, while the Knight data does differ from our previous, more representative work in the medium, it can be understood to be descriptive of the podcast “super listener,” a far more active, engaged listener who has a deeper relationship with the show(s) they responded to. This active audience is incredibly mobile: 93% say they listen to podcasts via smartphone, with 84% indicating that is their primary means of listening to podcasts. This differs somewhat from both our national data and some other public media data we have collected over the years, which shows somewhat higher desktop/laptop/web listening. This is also consistent with the average ages of these podcast listeners compared to the average age of public media broadcast listeners in general, who are far more likely to simply go to the web page(s) of public media organizations and listen directly on the web than they are to use a mobile podcast client. 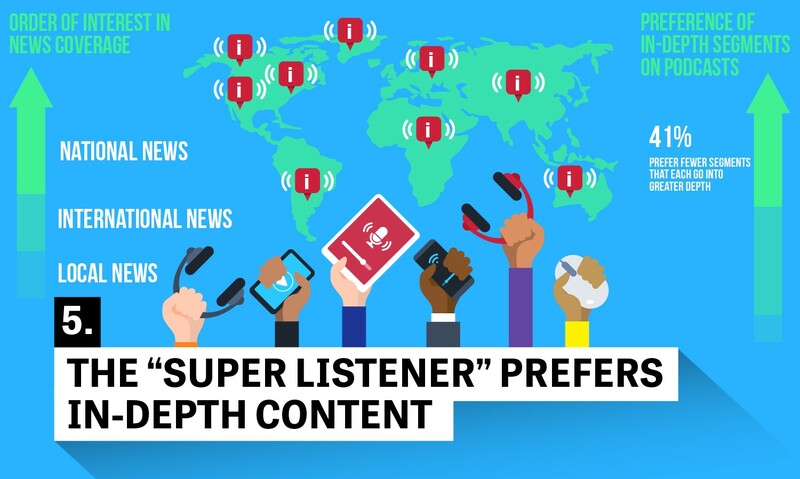 This “mobile-first” mentality for the super listener is reflected in the listening by location data. For Knight respondents, the primary listening location is at home (31%), followed by in a vehicle (23%) and at work (19%). This differs significantly from our Infinite Dial data, which shows at home as 52%, in a vehicle at 18%, and at work at 12%. Listening in other out-of-home environments (out walking, public transportation) was also much higher with the Knight respondents. Finally, the super listener is a compelling advocate for the medium itself. Fully 96% said they had recommended a podcast to friend. 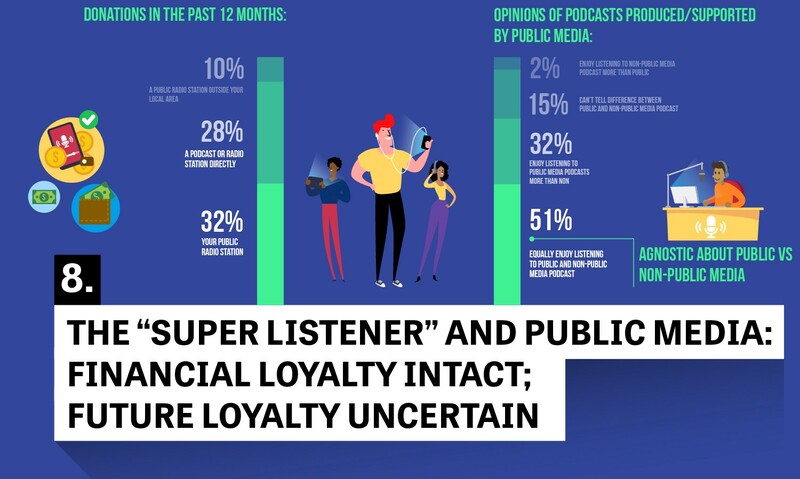 Word of mouth was the primary means for podcast discovery for these respondents, with just over half saying the primary means by which they learned about new podcasts were recommendations from program hosts or friends and family. In general, our respondents were much more interested in national news (7.5 on a 1–10 scale) and international news (7.1) than in local news (5.6). While there was a stronger preference for fewer stories/greater depth (41%) than a wide variety of shorter segments (10%), approximately half of these respondents had no preference. Among the average of 13 programs that weekly respondents consumed, an average of four featured local, national or international news. These respondents are also more likely to be podcast-first listeners to audio content. When asked how they would likely listen to a program released both on the radio AND as a podcast, 47% indicated they would listen only as a podcast and 32% said “more often” as a podcast. 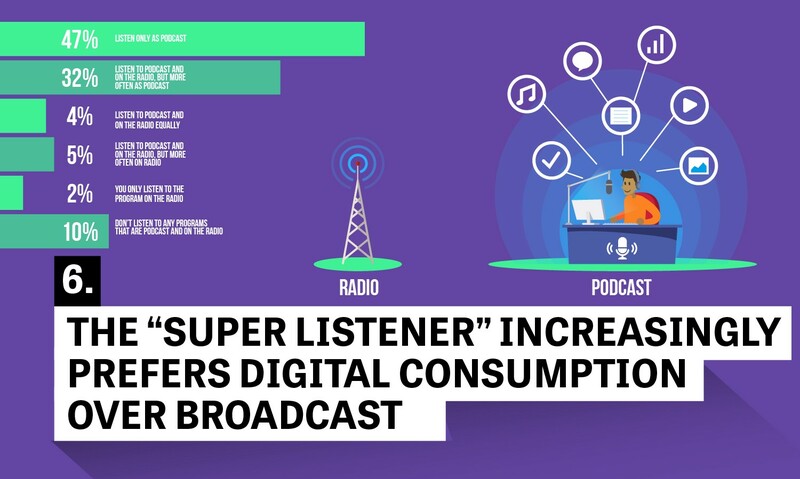 More than four in 10 respondents indicated that they were listening less to AM/FM radio as a result of podcasts, so this podcast-first mentality is not surprising. 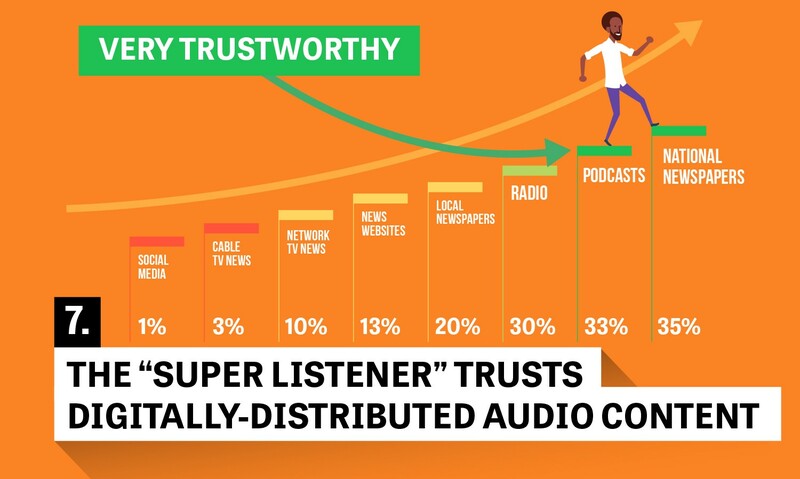 Finally, in one of the more significant findings of this study, these “super listeners” place a great deal of trust in the content they hear on podcasts. We compared a variety of media channels by their “trustworthiness,” and podcasts were indicated by 33% to be “very trustworthy” and 49% as “somewhat trustworthy.” This level of trust was nearly tied with the first place medium (national newspapers) and ahead of radio and local newspapers. Network TV news, cable TV news and social media were the bottom three in terms of trustworthiness. Given the provenance of these respondents, it was unsurprising to see how many public media podcasts they listened to. From the average number of weekly shows reported (13), these respondents believed that six were produced or supported by public media. Despite the fact that self-reported radio listening is down with these respondents as a result of podcast listening, two-thirds indicated that they have listened to their local public radio station in the last month. This active public radio consumption also translated to higher levels of support for public media. Nearly one-third indicated that they had donated money in the last year to their local public radio station, and 28% had donated to a podcast or radio program directly. This study, and our ability to compare it with two other, more representative datasets of podcast consumers, gave us a fascinating perspective on the public media podcast “super listener.” It is clear that while they don’t represent the body of podcast listeners across participating publishers, they do represent the most active, most engaged and most willing to take supportive actions. They can also be tapped as ambassadors for the medium. Finding ways to “ask for the order” and providing them with incentives to share new podcasts (and indeed, the medium in general) with their friends and family as passionate advocates and influencers might be one of the most powerful marketing tools at our disposal. We also learned that these respondents are receptive to national and international news content via podcasts, and they trust this content — again, as potential advocates for the dissemination of this content. 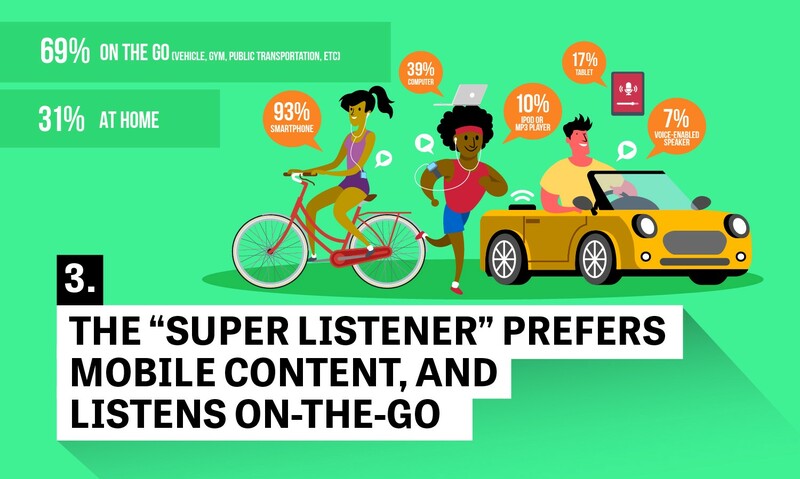 And finally, these younger, more mobile podcast consumers are taking content (including public media content) on the road with them — opening up contextual opportunities for new forms of content for consumers on public transit, at the gym, or in other short, opportunistic windows. We collected a total of 28,964 interviews with podcast listeners 18 years of age or older, all of whom listened to at least one audio podcast from one of six sources: National Public Radio, WNYC, American Public Media, WBUR, PRX and Gimlet Media. Respondents were solicited through audio callouts (solicitations typically done by the hosts) on the podcasts of these six networks. We used the actual download numbers for the podcasts and networks that were included in this project to weight the data, ensuring that each network was represented appropriately in the final dataset. In the course of this project, we investigated the listening habits and perceptions of podcast listeners to understand their behaviors and motivations. Samples of convenience, such as the one employed in this project, often differ from samples derived from telephone research and online panels. We were fortunate to have comparative data from both the Edison/Triton Infinite Dial research series (a nationally representative telephone survey of media habits) and an online panel survey from one of the six network partners that was conducted at the same time as the Knight-supported survey. As a result, we not only have a compelling picture of the audience for these podcast networks, but also an invaluable comparison of the podcast listener who responds to this form of audio callout survey to those recruited through traditional means. In general, there were very few differences between the listeners of each of the various partner public media podcast networks — indeed, there was significant overlap between them all.